The Chobe riverfront in Northern Botswana can be considered an all year round safari destination, but is at its peak in the dry months from June through to October. This peak coincides with large numbers of game concentrating on the riverfront due to water drying up in the hinterland. As the season wears on the vegetation close to the River takes a hammering, making it easier to spot game. The Chobe River during the dry season is known for attracting thousands of Elephants, a spectacle generally believed to be the largest Elephant concentration in Africa. The rainy season, mostly beginning in November, brings a lush green look to the area. The game disperses across the Northern Botswana wilderness during this time but good sightings can still be had along the riverfront. The rainy season is the best time for birding. The seasons of Chobe can be divided into the wet season and the dry season. The wet season is during the rains, from November through to March - sometimes stretching into late April - and the dry season is from June through to October. October is the hottest month of the year with temperatures often reaching 45° and it is at this time of year when the concentrations of game peak along the River. Although the rainy season is also a good time to visit Chobe, the best time for wildlife viewing is generally considered to be the dry season when the concentration of animals along the riverfront increases daily. The animals congregate along the River to make use of the life-giving waters in a barren wilderness. The best time to visit Chobe for birding is during the summer months when all the migrants are in the area. Late October through to April provides some of the best bird viewing in Botswana. 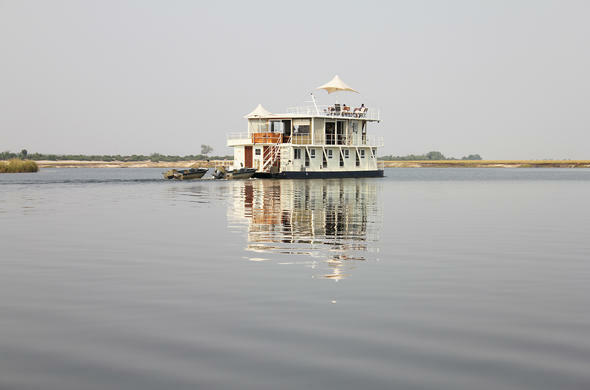 Activities in Chobe include game drives and boat cruises. Boat cruises along the River offer excellent viewing throughout the year, with the dry season providing some of the best water-based game viewing in Africa. Game drives are the most productive during the dry season when the vegetation has been eaten down by the animals, providing excellent visibility.